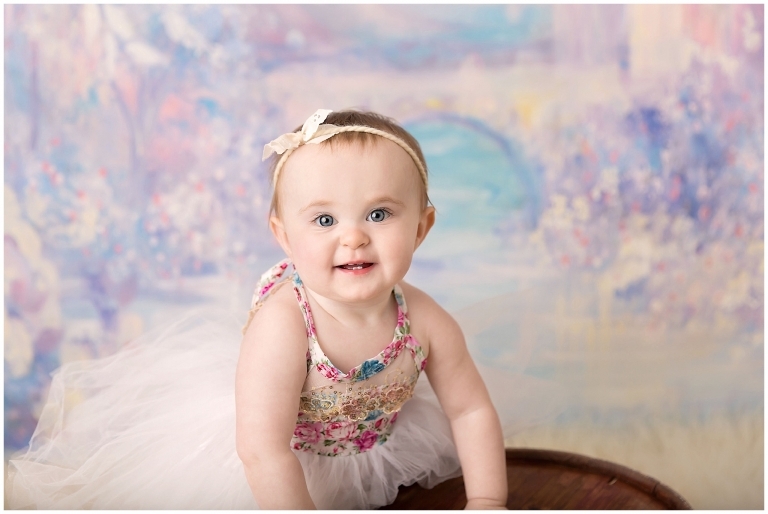 Welcome, Aria to the Brunswick Ohio photography blog by Mary Christine Photography! 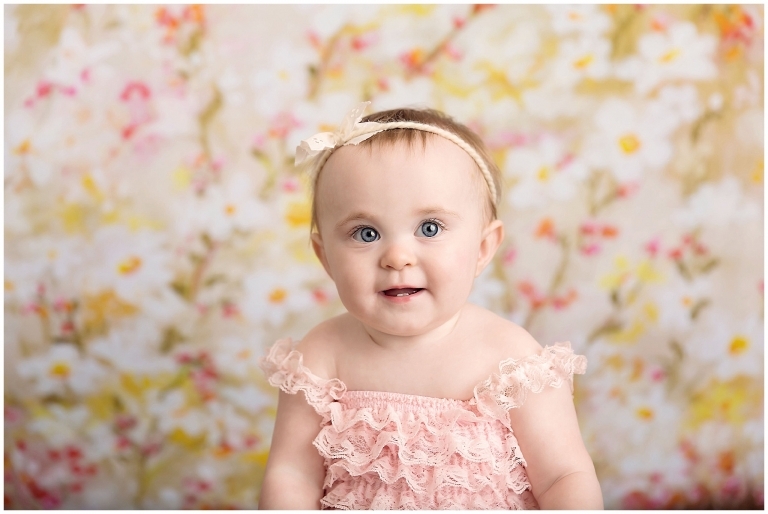 I have had the privilege of photographing this sweet little lady since she was a newborn and was so thrilled to celebrate her first birthday with her! In fact, this little lady is about to be a big sister soon! I cannot wait to see her at her sister’s newborn session! It seems like just yesterday she was snoozing through hers! She has been such a sweet little peanut from day one, she really stole my heart at just a few days old! I’m so thankful her parents drove to me from Brunswick, Ohio! Aria’s momma choose a pink and gold theme for her first birthday. Pink and gold has been all the rage lately with photography sessions, so it was fun to switch it up with balloons! I love a simple set for these, all the focus goes right on the baby! How adorable are her little teeth and those expressions on her face?? I love all the details in the cake smash sets! From those tiny hands, to the frosting on the everywhere, it really is quite adorable! Every once in a while, I like to switch things up with a backdrop. How cute is this princess drop from Intuition Backgrounds? 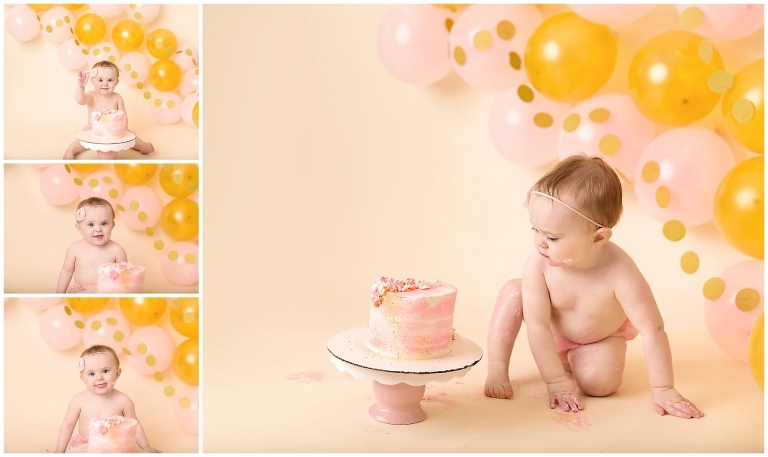 This set up is definitely perfect for a first birthday photography session! My goodness, those big blue eyes! Such a gorgeous baby girl! And of course those two front teeth peeking out are nothing short of adorable. Oh how I love watching these babies grow into toddlers! It’s so amazing to see! Thank you so much for stopping by the blog! Is your little one turning one soon? If you are interested in scheduling a Brunswick Ohio photography session, please contact me today to chat about scheduling. I would love to document your baby’s first birthday!